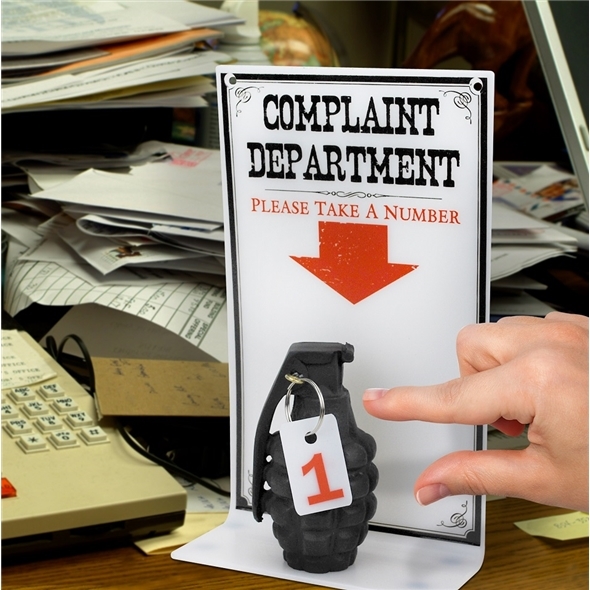 Funny Office Signs brighten up an office no end, and the Complaint Department Grenade is no different! It's a hilarious tongue-in-cheek approach to customer service and is guaranteed to get a few laughs in the office. If you've ever dealt with customer services or worked as a manager then you'll know that some of the complaints you have to deal with are trivial and pointless at best. If you're busy and you have a job to do, the last thing you want to do is deal with frustrating complaints over nothing at all. 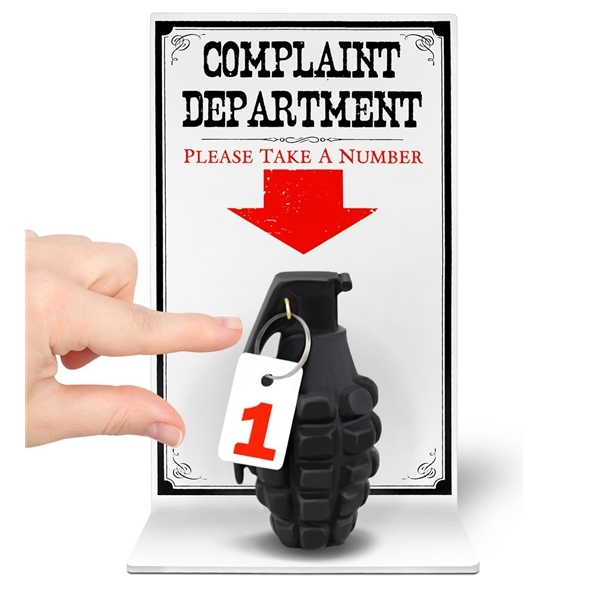 If your attitude to complaints is fairly er.. liberal, then this hilarious office sign is for you. 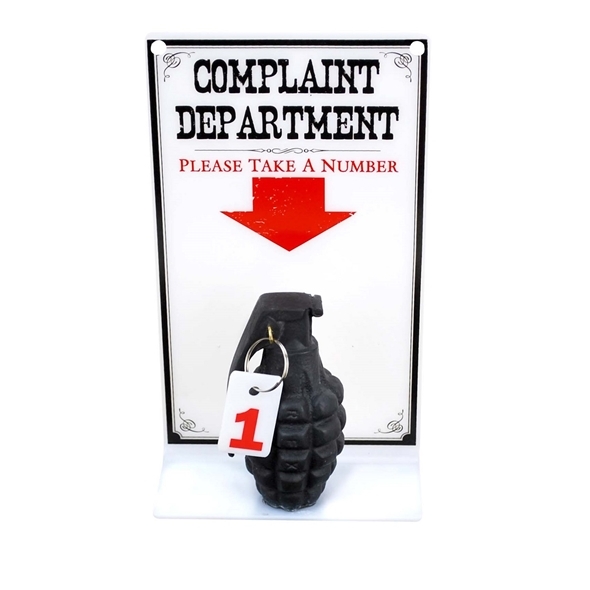 This little office sign is a grenade with the number 1 attached to the tag, and the sign says 'Complaint Department, Please Take a Number', which obviously means pull the pin and unleash the grenade. Though this is not a real grenade, it is a hilarious little sign that will brighten up your office no end and is guaranteed to get a few laughs. It will even serve as a polite and gentle reminder that anyone thinking about complaining should perhaps reconsider. 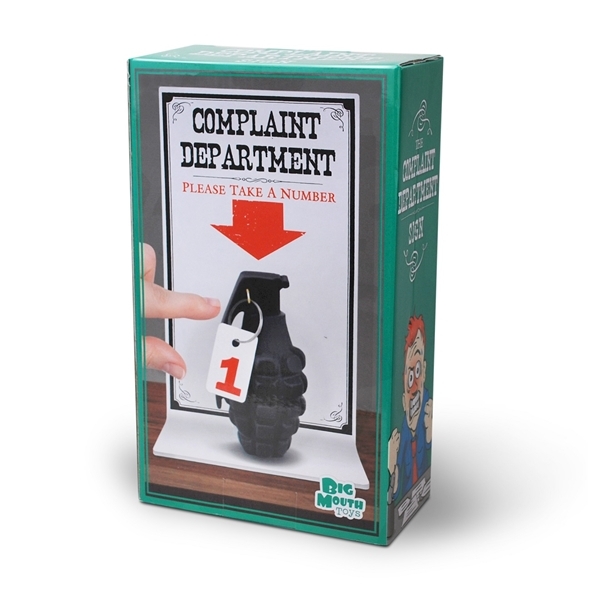 It's a great gag and a hilarious stocking filler for those poor people who regularly have to deal with monotonous complaints. Got this for the reception at my office and it's been a great laugh. I had an issue with my parcel being left at another house with a note but this was quickly resolved by your customer services, thank you. However, I will mark you down on service because I did not like it being left with a neighbor.